Photo shows Tony LaRussa speaking in 2012 at the Boys and Girls Clubs of Springfield fundraiser. 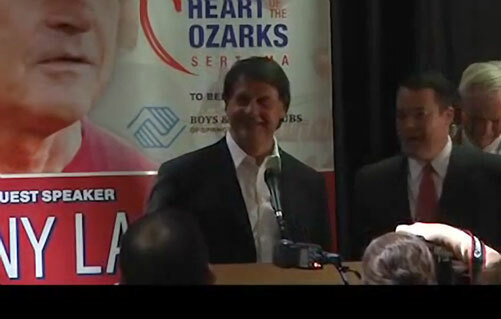 Watch Tony LaRussa speaking in 2012 at Boys and Girls Clubs of Springfield fundraising dinner. Tony La Russa is a former MLB manager and infielder, best known for his tenures as manager of the Chicago White Sox, Oakland Athletics and St. Louis Cardinals. He left Oakland following the 1995 season to manage the Cardinals, and led the team to three National League championships and the 2006 and 2011 World Series titles. On Oct. 31, 2011, he retired three days after winning the 2011 title and after 33 seasons as a MLB manager. Sports Speakers 360 is a booking agent for pro athletes. If you would like to book Tony La Russa for a speaking engagement, appearance or endorsement, contact Tony La Russa’s booking agent for fees at 1.855.303.5450.